Today's focus activity is a short video about World War II. Describe the causes of World War II. Explain the debate over U.S. neutrality and its thawing in 1941. Explain why and how the U.S. government interred Japanese Americans. Describe how the war was fought in the Pacific. Explain how D-Day was a major turning point in World War II. Explain how the war impacted the U.S. economy. Describe the effects World War II had on women and culture. Explain the debate over use of the atomic bombs on Japan. Describe how the Holocaust was carried out by Hitler and the Nazis. Explain how the war came to an end and the problems faced thereafter. Why it is important to study the history of the U.S. during World War II. How the events, issues, and outcomes of World War II effect us today. Lesson 63: A Storm's Brewin'! Big Band music started late 1920s and by the 1940s was the most popular type of music. Small jazz groups in the 1920s began to add more instruments and even orchestras to their groups to persuade older and more conservative audiences to buy records. Big band music then branched into several different forms of music. Swing jazz included the use of a more free flowing rhythm using four beats to a bar instead of the two beats that was common in New Orleans dixieland jazz. Most swing music used riffs. Riffs, were a technique that developed in swing where different instruments would echo each other. The instruments were usually grouped into brass instruments like trumpets and trombones and reed instruments like saxophones and clarinets. Many of the early swing jazz bands grew to have 16 or more instruments playing. At this point, many of these swing jazz big bands rightly referred to themselves as orchestras. Many of the most popular swing era bands featured beloved vocalists such as Louis Armstrong, Billie Holiday, Ella Fitzgerald, and Frank Sinatra doing their own versions of older songs. Often, music will influence the way a dances develop. However, with swing jazz, it was the other way around. The bands playing to live dancing audiences would tailor the music for the dancer's benefit. So many dances came onto the scene during the swing era as well. These swing dances originated in, and became popular in New York City, Kansas City and Chicago. Some of these dances were the Balboa, the Charleston, the Shag, the Swing, the Jitterbug, the Boogie-Woogie, the Bop, and the Jive. There were two main types of "Jazz Swing" bands in the 1930s and 1940s. They were either "sweet" or "hot." Sweet bands were bands who played sweet, softer, more heart felt tunes. Usually they were slower paced, used less improvisation, and focused mainly on the vocalist or singer with the band as the background. As a general rule, these bands were usually led by white bandleaders and made up of white musicians. Duke Ellington and Glenn Miller were two popular "sweet swing bands". Hot bands were bands that played fast-paced, heart-racing, jump tunes. emphasized vocal numbers rather than instrumentals; they were typically led and staffed by white musicians. Glenn Miller and Tommy Dorsey headed up two of the most popular such bands. But the big bands that were most important to the later development of modern jazz were "hot" ones, and were generally (though not exclusively) associated with African-American musicians. Many of the great early improvisers worked with bandleader Fletcher Henderson between the early 1920s and mid-1930s. Henderson and his arranger, Don Redman, helped define the rhythmic conventions that gave the band a sure and steady sense of swing; they were aided in this task by the indomitable Louis Armstrong, who became Henderson's chief soloist in 1924. Benny Goodman, a master clarinetist, was one of the few white musicians to lead a very jazz-oriented, hard-driving, hot band—and also one of the few ensemble leaders who hired both blacks and whites. Known as the King of Swing, Goodman became hugely popular at the end of the Depression and paved the way for later bands—both black and white bands, as well as racially mixed ensembles like his own. "Soda Fountain Rag," written at 14 and never recorded by him, was much indebted to James P. Johnson's "Carolina Shout," which, like many aspiring pianists of his generation, Ellington taught himself to play by slowing down the role on the family pianola [player-piano] and placing his fingers on the depressed keys. This very motivated, handsome, and dignified young man eventually grew up, moved to New York, and became a world-famous performer. He was a genius at both composition and bandleading itself—one of his greatest talents was his ability to mentor and manage dozens of brilliant fellow musicians. In his arrangements, Ellington wrote parts not simply for "saxophone" or "trumpet," but ones suited to the individual personalities, playing styles, and sonic quirks of each musician in his employ. He was a born leader. The creator of over 2,000 pieces of music, "Ellington is often called America's greatest composer," Giddins writes, "and just as often ignored entirely in discussions of American music, an indication of a [racial] separatism that continues to vex the nation's cultural habits." Many of his compositions are beloved jazz standards, played and recorded again and again by new generations of traditional instrumentalists and singers: "Mood Indigo," "Solitude," "I'm Beginning to See the Light," "Cottontail," "Prelude to a Kiss," and many others. Ellington was also responsible for sponsoring great compositions by several of his band members, such as trombonist Juan Tizol ("Caravan" and "Perdido") and pianist and staff composer Billy Strayhorn ("Lush Life" and "Take the A Train"). Ellington took his music very seriously and expected audiences and critics to do the same. For this reason, he was ambivalent about the label "jazz," which was still being used by cultural snobs to set this music apart from what they considered true art—and by racists to signify "primitive" music. "Jazz is only a word and has no meaning," Ellington once said. "I don't know how such great [musical] extremes as now exists can be contained under one heading." Still, as Giddins points out, Ellington's music "is entirely rooted in what we recognize as jazz principles and usually (but by no means always) exhibits some or all of the standard characteristics: an equation of composition and improvisation, robust rhythms, dance band instrumentation, blues and song frameworks, blues tonality." Gridley notes that Ellington's New York band, which ultimately operated for nearly 50 years, featured a huge number of different themes, rhythmic figures, and chord voicings, making it arguably the most innovative and progressive of any American big band ever. In addition, many Ellington sidemen went on to become the most creative, original artists on their instruments: Cootie Williams, a trumpeter who pioneered the growl style of modern jazz trumpet playing; bassist Jimmy Blanton, who became one of the first virtuoso improvisers on his instrument and revolutionized the role of the string bass in jazz; Johnny Hodges, the lead alto saxophonist who perfected the technique of smearing, or portamento, which involves gliding from one note to the next "so gradually and smoothly that it sounds almost as if his instrument were equipped with a slide, like a trombone," in Gridley's words. While Duke Ellington's band was setting the gold standard of New York jazz big bands, Count Basie was helping define the so-called Kansas City style of swing. William Basie, born in Red Bank, New Jersey, in 1904, ultimately spent 55 years recording music, 48 of those at the helm of his own orchestra. To this day, many jazz fans consider Basie's outfit to be the most swinging and consistently exciting of all the hot bands. "Kansas City style was not based on the interweaving lines of the collectively improvised New Orleans style," writes Gridley. "Arrangements in the style were based instead on short musical phrases called riffs that are repeated again and again. Riffs serve two functions. Sometimes they are theme statements, and sometimes they are backgrounds for improvised solos. A few of these riffs were written down, but many were created spontaneously during a performance ('off the top of someone's head'), learned by ear, and kept in the heads of the players." I've always built my band from the rhythm section to the [tenor saxophones], then onto the rest, for the living pulse of band is naturally the rhythm section. The piano can create a mood but it can also join forces with the guitar, bass, and drums to become a power unit that drives and motivate the entire outfit. The result should be "solid" but also flexible; there must be control that is not confined. Like Ellington, Basie had an eye for talented band members; many of the best jazz trumpeters and saxophonists of this era spent time in his organization. The brilliant Lester Young, whose cool, fresh, light-toned playing helped inspire an entire category known as "cool jazz" in the late 1950s and early 1960s, was just one of many notable Basie band members. Count Basie was also influential as a pianist: his light, precise, elegant approach to comping (short for "accompanying") and soloing defined a whole new sound for this instrument in the jazz context. Several other musicians of the swing era expanded the role of the piano in both big band and small combo settings: Art Tatum (1910-1956), who had dazzling technical mastery over the instrument and an unparalleled ability to spontaneously change the harmonic elements of the song (i.e., make instant chord substitutions) while retaining the tune's basic structure and flavor; Teddy Wilson (1912-1986), whose playing was as dazzling as Tatum's but a bit more stream-lined; and Nat "King" Cole (1917-1965), whose excellent piano skills were ultimately overshadowed by his success as a popular singer. These musicians paved the way for later ones who would take the art of jazz piano to a level of refinement, sophistication, and breadth equal to or even greater than the great keyboard artists of the European classical tradition. Asirvatham, Sandy. "'Hot Swing, Sweet Swing'." The History of Jazz, African-American Contributions. New York: Chelsea House Publishers, 2003. African-American History Online. Facts On File, Inc. http://www.fofweb.com/activelink2.asp? ItemID=WE01&iPin=AACHJ04&SingleRecord=True (accessed March 29, 2014). The role of the band leader also changed as the size of the band or orchestra grew. Before the size of these bands grew, bandleaders would stand in front of the band and wave a baton. With swing jazz, the bandleader often played an instrument as well - mainly performing solos. Benny Goodman was a famous bandleader who did this playing the clarinet. Count Basie was a bandleader famous for showing off his piano skills. In the US, by the late 1930s and early 1940s, swing music had become the most popular musical style and remained so for several years, until audiences started favoring big bands that accompanied crooners. Crooners were male singers who sung soft, sentimental songs. These would be similar to the teen idols of today. Big Band Leaders such as the Dorsey Brothers, Benny Goodman, Glenn Miller, and Duke Ellington helped start crooner's careers. Frank Sinatra was a very popular crooner of this time. Sinatra became the first "teen idol". Other crooners of the time included Bing Crosby, Nat King Cole, Fred Astaire, and Jim Reeves. Do you remember the type of music that was the foundation for Jazz? "The Blues" gained popularity again in the 1940s, with artists like Ella Fitzgerald and Billie Holiday by adding big bands or orchestras as accompaniment for the singers. Their songs focused on love lost and life's problems as well as the racial tensions of the time. Another type of music that developed from big band music was western swing. Throughout the 1930s and 1940s, cowboy songs, or Western swing, became widely popular. During this time, Hollywood movies included singing in most productions. Cowboy movies soon became a popular movie type and singing cowboys such as Roy Rogers and Gene Autry became very popular in the U.S. Soon, film producers began using full orchestras. Western swing would soon develop its own new type of music called - honky tonk. Honky tonk is more like the country music of today. Honky tonk meshedWestern Swing and Blues Music. Honky Tonk was rough, backed by instruments such as the guitar, fiddle, string bass and steel guitar. It had the "poor, poor me" lyrics similar to the country music of today - You know - "I'm drunk because my wife left me and took all my money; my dog died; my truck broke down; but mama still loves me anyway!" Some popular Honky tonk musicians of the era were Ernest Tubb and Hank Williams. Hank Williams' music would be a contributing factor in the birth of Rock and Roll. Look at the icons below. Each group will investigate the videos linked to each icon below. Each icon has a video of one of the types of Big Band Music that developed during the late 1930s to the early 1950s. 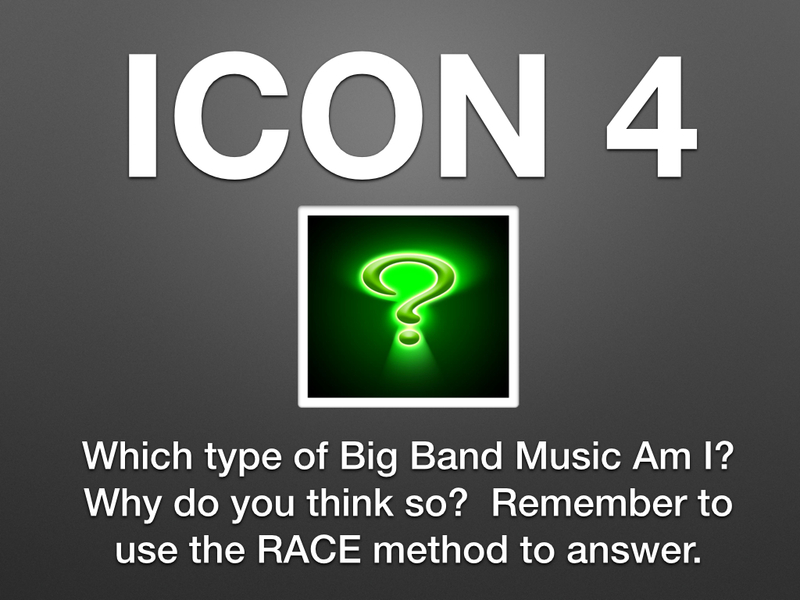 Use the reading above to identify which type of Big Band Music is represented by each icon. After your group comes to a conclusion, write your answer in today's portfolio entry in PQA format. 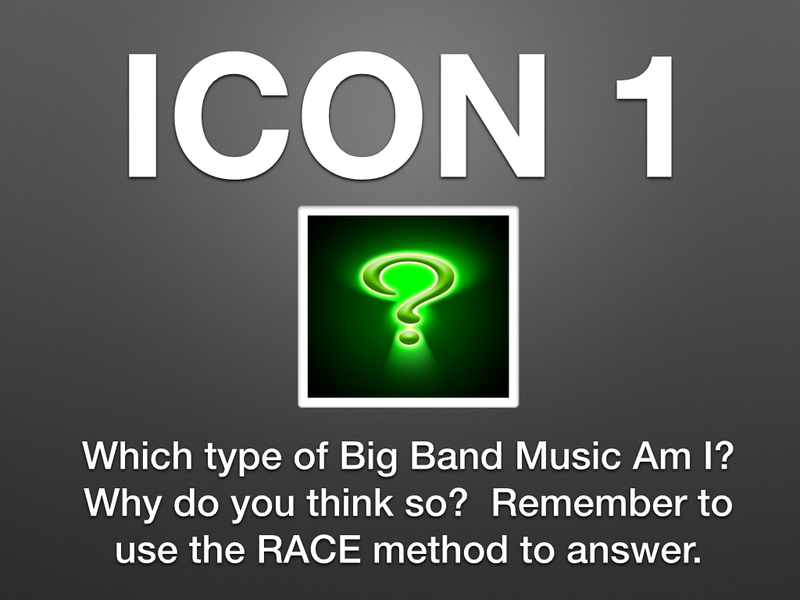 Use the Race method to write and support your answer with facts from the reading. Now you will compare and contrast the music of the late 1930s to the early 1950s.